WHAT IS AN OFFICIAL ARIZONA CENTENNIAL LEGACY PROJECT? An Arizona Centennial Legacy Project accurately portrays a significant aspect of Arizona history, is educational and everlasting. Approved by the Arizona Historical Advisory Commission Board of Directors as the Official "Buffalo Soldiers 9th and 10th Cavalry and 24th and 25th Infantry" organization in the State of Arizona on August 11, 2011. Founders Commander Fred Marable and Deputy Commander Michelle London-Marable (husband/wife) decided to keep the memory of the "Buffalo Soldiers", 1866 - 1902 history alive. Founded: December 3, 2007. 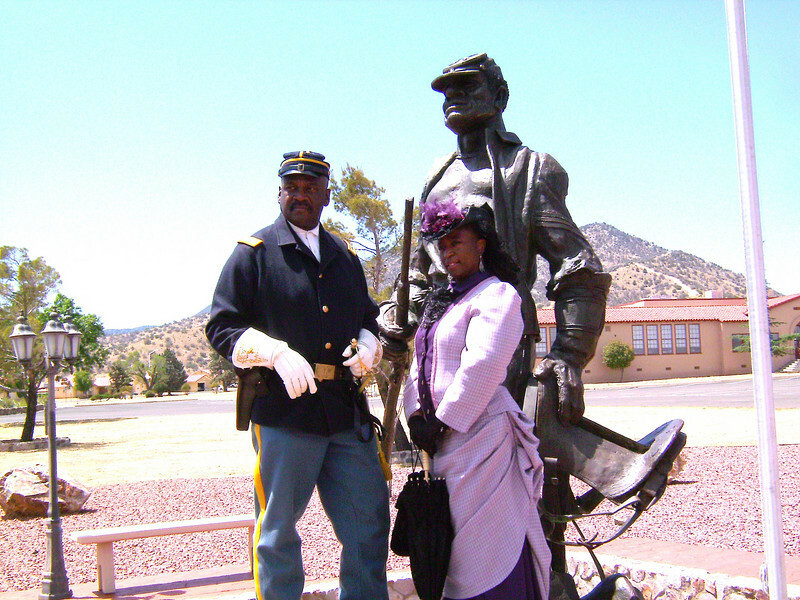 Official Arizona Centennial Legacy BUFFALO SOLDIERS OF THE ARIZONA TERRITORY - LADIES AND GENTLEMEN OF THE REGIMENT, Headquarters Mesa, Arizona is a Non-profit 501(c)(3) organization. Commander Marable protraying Colonel Charles Young the 3rd Black Officers to graduate from West Point Academy. Deputy Commander Michelle London-Marable is protraying the 1st Black Female Buffalo Soldier "Cathy Williams", 1866 - 1868. We are committed to teaching the history of the "Buffalo Soldiers" in general the 9th and 10th Cavalry and 24th and 25th Infantry in particular to preserve the history of our former slaves that served in the U.S. Army six regiments Colored Troops in the Civil War to be freed. Additional, LADIES AND GENTLEMEN OF THE REGIMENT and Historical Black Americans Experience Heroism of other Black Milestones that have accomplished higher education need to be told and preserve the history of our former men and women of slavery, 1866 - 1902. (Double click on the gallery picture for additional pictures and description). Copyrights 2007. All Rights Reserved. The Official Arizona Centennial Legacy Project Buffalo Soldiers of the Arizona Territory - Ladies and Gentlemen of the Regiment (Young Buffalo Soldiers and Young Ladies of the Regiment -children), Headquarters Mesa, Arizona is an INDEPENDENT ORGANIZATION and is not affiliated or associated with other named "Buffalo Soldiers" organizations or groups for profit or non-profit foundations, motorcycle clubs (bikers), social clubs, chapters in the State of Arizona or Nationally. Cmdr Fred Marable and Pvt. Michelle London-Marable portraying as a Lady of the Regiment instead of a "Buffalo Soldier" Cathy William today.